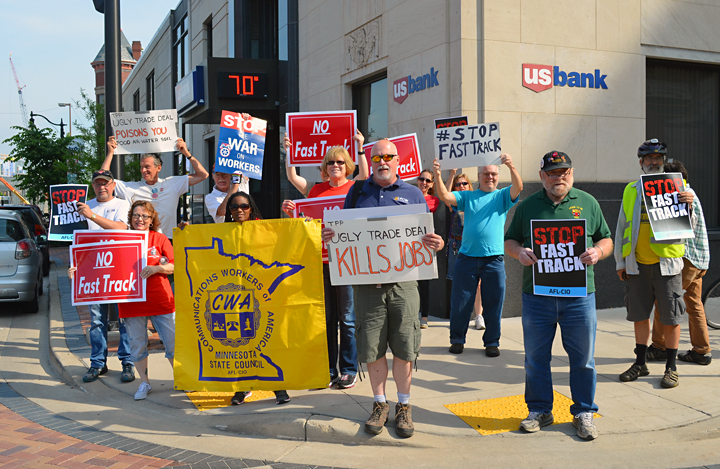 Union members from Minnesota and Wisconsin stand together against Fast Track and the TPP outside Rep. Ron Kind’s Eau Claire offices. EAU CLAIRE, Wis. – In a showing of cross-border solidarity, fair trade activists from Minnesota bolstered the ranks of local activists protesting today outside the offices of U.S. Rep. Ron Kind, a lead proponent of legislation that would “fast track” more bad trade deals that threaten U.S. jobs. 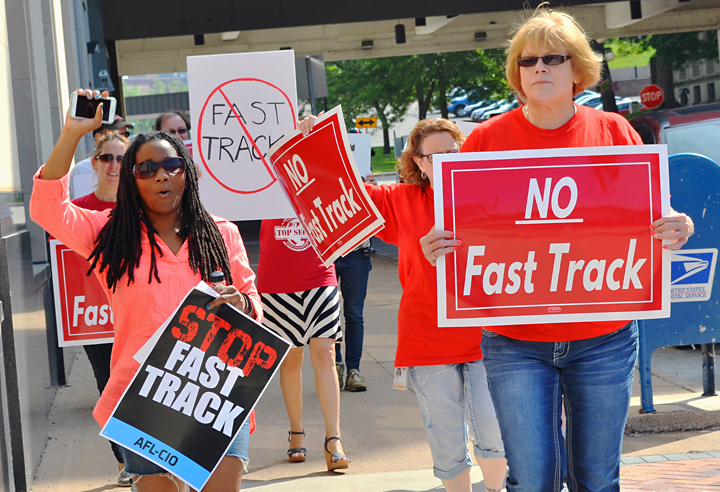 Fast Track, or “trade promotion authority,” passed the Senate last month, and the bill could draw a vote in the House as early as tomorrow. That means labor and environmental activists are in full campaign mode, urging lawmakers like Kind, a Democrat from Wisconsin’s 3rd Congressional District, to reject the measure, which would limit Congress’ ability to influence trade agreements negotiated in secret, like the 1,000-plus page Trans-Pacific Partnership. Current proposals in the TPP would allow multinational corporations to challenge local ordinances governing food safety, setting wage and lending standards or establishing “buy-local” procurement policies – and to do so in extrajudicial trade tribunals. Union members from Wisconsin said they’ve reached out to Kind with concerns that Fast Track would pave the way for more NAFTA-style, job-killing trade agreements. But so far those concerns haven’t moved Kind out of the “yes” column on Fast Track. Today’s action, demonstrators said, is a reminder that they aren’t giving the congressman a pass. “We’ve got to do things like this to make our voice heard, to hold him accountable,” O’Brien said. A delegation of about 15 Minnesotans, including several members of the Communications Workers of America and activists from the Minnesota Fair Trade Coalition, traveled here today to support the Wisconsin action. Meyer said Minnesota’s DFLers are solidly opposed to Fast Track, and activists were looking for ways to help out elsewhere.